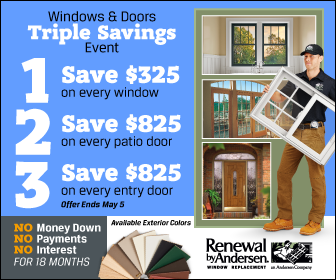 / Information / WHAT MAKES RENEWAL BY ANDERSEN® DOORS IDEAL FOR YOUR HOME? WHAT MAKES RENEWAL BY ANDERSEN® DOORS IDEAL FOR YOUR HOME? We use doors every day, which is why these will wear out over time. When it’s time to replace worn-out or broken doors, you can trust Renewal by Andersen® of St. Louis. We offer high-quality patio door solutions that ensure beauty and durability for your home. Traditional French door – This comes with traditional board stile and rail construction. It also comes with mortise- and-tenon joints. Andersen Frenchwood® hinged and outswing – If you want to save interior space, choose outswing St. Louis French doors. Both styles provide a large access way and come with glass fiber reinforced composite interior. Andersen Frenchwood gliding – This is another ideal style if you want to save more space. We cover the frame with rigid vinyl sheath to make the door more attractive. Contemporary gliding – This series has thin frames and sashes for larger glass area. Andersen Perma-Shield® gliding – Like that of Frenchwood gliding doors, Perma-Shield also comes with a vinyl sheath. Andersen Narroline® gliding – Doors under this line have a stainable natural pine interior with mortise- and-tenon joints. Long-lasting performance – We make our doors with high-quality wood to keep you and your family safe from elements. Our gliding doors guarantee a smooth glide even after years of use because we install them on Andersen track rollers. Energy efficiency – Our doors can help create a comfortable indoor environment during any season. We ensure weather-tight seals in every door that we install. Beauty – Just like your entry doors in St. Louis, MO, Renewal by Andersen patio doors can enhance the look of your home. We offer a wide range of interior and exterior colors and decorative hardware to go with your doors. We also have grille patterns and insect screens for added curb appeal. Security – Our hinged doors come with a five-point locking system, whereas gliding doors have a reach-out lock that pulls the door tightly into the jamb. For a worthy patio door investment, choose Renewal by Andersen of St. Louis. We can help create a more comfortable, beautiful, and secure home with our products and services. Call us today at (314) 332-2364 to learn more about our patio doors.